Sale! Save $4/kit off of our wholesale price when you buy two or more of this item. Special: ONLY $75.99 each when you buy 2 or more! Save at least $8! 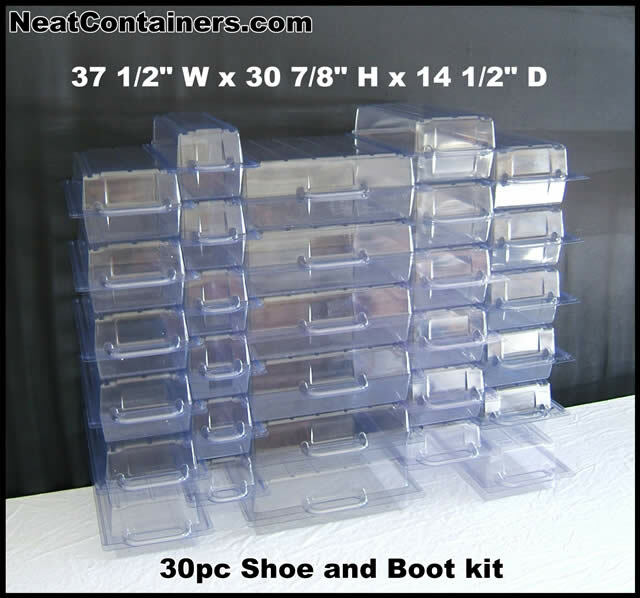 The Shoe and Boot Kit (30pcs) is a popular choice for those looking to get their shoes and boots under control. (6) of our #4 "Boot/Sweater" Pods for boots, sweaters, jeans purses and more. We know that the drawer-like functionality is kind of a new concept for containers so be sure to watch the home page animation if you’re not sure how they work. Click the “replay” button if you missed it. Remember - there are absolutely NO TOOLS required. All you need are the containers with our patented design. Need to pare a few inches off this kit to fit? We can take out a column of 6 #1's and replace them with 6 pieces of the #3. This will save 2" off the width. New width is: 35 1/2". Make a note on your oder and we'll swap them out for you at no charge. Also, you can split this kit into two by setting up at half height if you need to. And remember, you can expand in length and width too! This is my third order. I must say, your product is fantastic. Doesn't take up much space and looks very neat. I love it!!!!!!!!!!!!!! ..
Dear Ron, just wanted to thank you. I received my order just as you stated, Saturday morning. We put it together and I love it. Again, thanks .. The service for buying the shoe rack was exceptionally good. I received instant confirmation of my order from a person with a name! at Neat Containers and a telephone number in case of questions. Payment was easy with PayPal. .. Thank u so much!!!! Your containers have literally been a god send, I tell everyone to buy them I'm totally in love. They make being ocd that much easier lol... ..